If you eat meat, you like bacon. If you're reading this blog, chances are you are in the practice of transforming raw meat into something cured, and bacon is probably on that list of to-do's or have done already. What continually amazes me about folks making bacon, though, is how many people seem to be unsuccessful with their product. Having a farm and being active in various meat and farming groups, I wanted to put together a simple post for how to be successful with making bacon. What is bacon? I bring this up, not because I'm trying to fill the page, but because there are various "types" of bacon around the world. There is Australian bacon, buckboard bacon, Canadian bacon and of course, what we here in America call bacon. It's the American version that I'm going to focus on here, as it seems to be the most popular based on posts and questions. To put it simply, bacon is belly meat from a pig (obviously) that is salted, accompanied by different spices and flavorings, to cure before smoking of some sort. There are a number of different ways to "cure" using salt, from salt box method, to brining to equilibrium curing. When it comes to smoking, you can cold smoke, you can cold and hot smoke and you can hot smoke. For the purposes of this recipe, we will be curing using the equilibrium method and hot smoking. Curing and smoking have been preservation methods for meats and other produce for centuries. Both, on their own are methods of preservation, but together, they can create some beautiful, delicious end products. Curing is, most simply, the act of preserving meat through the addition of salt. Salt reduces the water activity in meats, reducing the chance of spoilage. We will be using the method known as Equilibrium (eq) Curing, which means to add a percentage of salt based on the total weight of the meat. This will protect against over salting and set you up for more success. Smoking, for preservation, is a hot smoke that acts as what's known as a kill step. Bringing your meat above 135 degrees, is when the nasties start to die off, but it would take a long time at that temperature. To be safe, and continuing with the theme of fail proof and success, you'll want to take your product to an internal temp of 150-155. For this purpose, we'll obviously be using the hot smoking method. This is one of them more touchy topics around curing meat and I am not going to get into the pros and cons, or truths and myths around Nitrites and Nitrates. What I will say though, is that every bacon product sold in this country does have some form of Nitrites/trates that it is treated with. Whether it's cure 1 or celery juice powder, there are nitrites present. If we were talking ground products, I may be a bit more in-depth as to the needs for nitrites/trates, but for the purposes of bacon, I'm going to keep it high level. 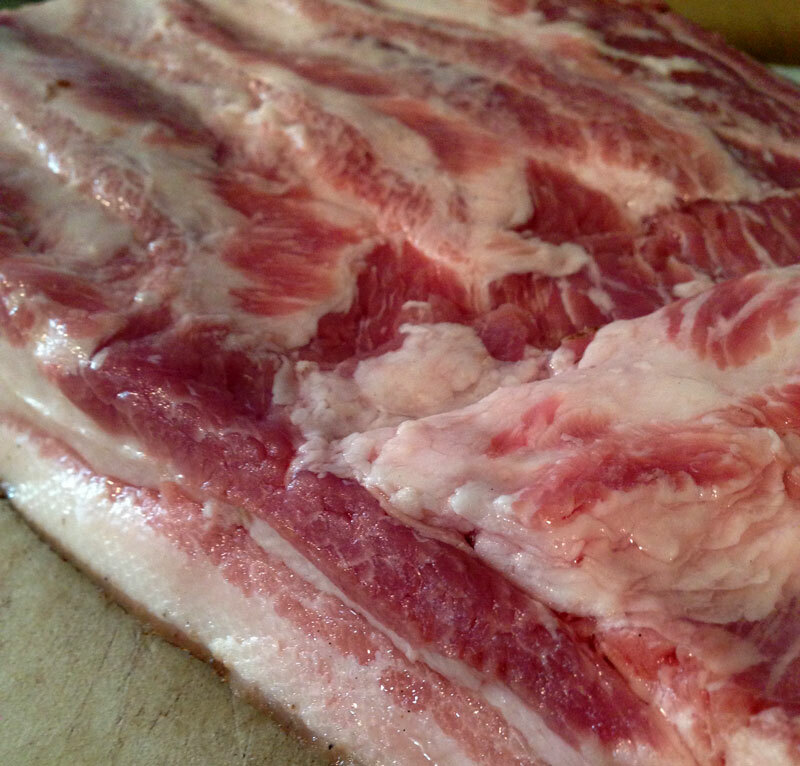 When you're dealing with whole muscle curing, of which bacon falls into, the use of nitrites/trates becomes a bit less critical, as there are no air pockets for nasties to develop, which is where the cure 1 or 2, comes in to save the day. What it does do, however, is preserve color and impart a flavor. You read that right, impart flavor. You see, the bacon taste that our country has come to know and love is largely impacted by the addition of nitrites/trates. In addition to the color and safety benefits, it's the nitrites/trates that give bacon it's "ham" like flavor. I've ready many a facebook posts of people not using cure 1, that remark that their bacon doesn't quite taste like the bacon they "know", and I would venture to guess, that in most cases with all things being equal, it's due to the lack of cure 1. With bacon specifically, cure 1 is largely a flavoring agent. On to the making of something. Making bacon is simple and leaves a ton of room for experimentation. If you have a good base on which to build, the possibilities are endless. We've made coffee and black cardamom, bourbon maple, aleppo and pink peppercorn to name a few. Here is the base recipe. Weigh pork belly and record weight. It's much easier to record in grams than pounds when dealing with percentages. Based on that weight, measure out the rest of your ingredients in a separate bowl. Combine meat and ingredients in a zip lock bag and rub the mix all over the belly. Cure in fridge, for 2 - 3 days per pound (5lb belly will be 10 - 15 days). Remove from cure and rinse off mixture. Pat dry with a paper towel. Place belly on a wire rack, over a cookie sheet or plate, and allow to dry in fridge for 2 days to form a nice pellicle. Remove from fridge and let come up to room temp before smoking. Start your smoker with your favorite woods and smoke at a temperature of about 200 - 250, until your belly reaches an internal temperature of 150. Remove from smoker and allow to cool to room temperature before placing back in fridge and/or slicing.